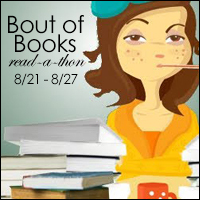 Bout of Books starts on Monday, August 21st and goes through Sunday, August 27th. My goal for the Bout of Books 20 TBR pile is to read 250 pages per day, which amounts to 1,750 pages for the whole week. I am excited that I will be on vacation for 4 out of the 7 days of this bout of books, so I should be able to read away those days! This is a total of 1,882 pages!